It is a golden era for animation at present. There are a number of big studios having success with CGI and Stop-Motion animation and Oregon based company Laika have been carving themselves a nice little niche by being much more off-beat than many of their competitors. 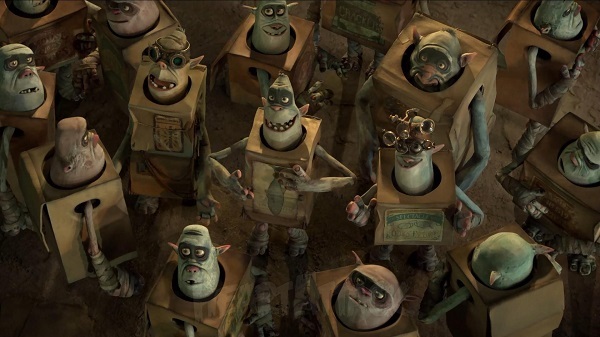 Under the town of Cheesebridge is a society of a creatures known as the Boxtrolls. They harvest human trash and turn it something useful. The Boxtrolls have also raised a human child, Eggs (Isaac Hempstead-Wright) for ten years. But on the surface the Boxtrolls are feared with stories of them snatching children and eating people, while the power hungry Archibald Snatcher (Ben Kingsley) is charged with task of exterminating them. With the Boxtrolls' number dwindling, it is up to Eggs and his only human friend, Winnie (Elle Fanning) to save the Boxtrolls and the town. 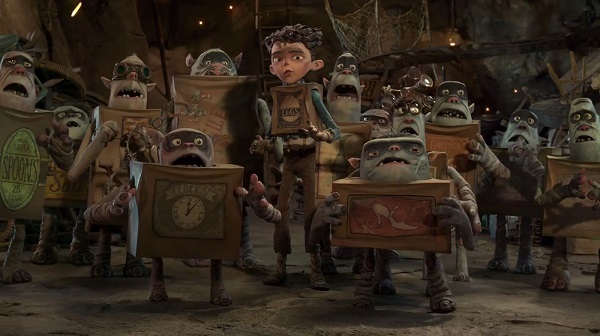 Like Laika's previous movies, The Boxtrolls is fantastically animated. There was plenty of talent working on this third feature. The Boxtrolls is wonderfully designed, the trolls themselves, their underground home and the city, resembling Paris and Brussels. Laika give The Boxtrolls a steampunk look, particularly the vehicles and some of the towns people having a military style dress. The animation is detailed and fluid as you would expect. The humor provided is of an off-beat nature, relying on witty lines and observations, as well as moments of slapstick and visual humor. There are some cleverly written jokes, some designed for adults such as some political satire, but The Boxtrolls is a movie that will make audiences chuckle more than outright laugh. The Boxtrolls has a strong voice cast and they all give solid performances. Jared Harris, Nick Frost and Richard Ayoade had the best moments in their supporting roles, having the best jokes and lines in the movie. No one gives a bad performance and actors like Ben Kingsley and Simon Pegg are unrecognizable, but Toni Collette was wasted in a small role. Though the animation and setting in The Boxtrolls is inventive, the story and themes are very predictable. The plot points can be seen from miles away. There's plots about Eggs' saving the Boxtrolls, Eggs' finding out about his past, that the villain played a part in our protagonist's disappearance as a baby, the villain having a secret scheme and Winnie's father (Harris) having to realize what is more important, his position or his daughter. This is all standard stuff and is really disappointing that a studio with such a reputation for being unique would use such a pedestrian screenplay. The Boxtrolls has Laika's trademark wit and animation, but it is the hampered by its very predictable, unoriginal screenplay and storytelling.